Often times I am perplexed by just how many bad casinos there are on the Android platform today. There are many places that just roll with the punches, putting out cookie cutter forms of software that include the same few games and really do nothing to separate themselves from the pack. These casinos are a real chore to review for me, as I look to find the words to accurately describe them and give a fair and balanced assessment of something I already know is going to be disappointing. Once in a while though, a casino will come around and change my attitude toward online gambling as a whole. The mobile software is nice, the games look and play well, and I just have fun. These are the Android casinos that make my job enjoyable, and I love when I can get my hands on such spots. Wizbet Casino is definitely one of these places. What makes it so special? Read on to find out. When I first visited Wizbet on my HTC Droid DNA, I was happy with the way the casino looked on my 5 inch screen. Everything was colorful, and the site’s buttons were made so that it is easy to reach in and press what you need without making a mistake. Registering an account was easy for me, as I simply selected the register tab, put in some personal information, and then logged into the site. With the way that everything is set up here, I think the whole process took about two minutes. As an American, I am used to having limited banking options at internet casinos. It is simply something we cannot control, as our government implemented the Unlawful Internet Gambling Enforcement Act of 2006, which restricts banks from processing gambling related transactions online. Unfortunately for me, this meant that I was only able to deposit at Wizbet using my Visa card. Players from other countries can deposit through Ukash, PaySafeCard, GiroPay, UseMyWallet, and Bank Wire. I started off by depositing $100 into Wizbet, and was met with instant approval and had my bankroll instantly credited. While there may not be a lot of options for us Yankees, the Visa deposit did go through with no issues. Before you make your first deposit at Wizbet, you are given the option of accepting an initial deposit bonus of 200% (up to $400). After I made my deposit, I went to the customer support on my Android (yes, you can chat with live support on your phone!) and told them I wanted this credited. The staff member who assisted me gave me a code to enter into the bonus tab in the cashier section of Wizbet’s Android casino, which when entered gave me my extra money. The whole process was very smooth, and I think that Wizbet’s customer support was very kind and helpful. The Games: Unique and Fun! After getting all of the necessary rigmarole out of the way, I was finally able to take part in some casino games on my Android. Wizbet’s offering isn’t tiny, but it certainly isn’t the largest mobile casino library that I have seen either. 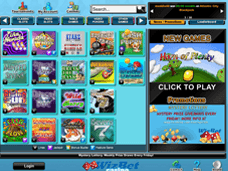 There are 25 slots on tap at Wizbet’s mobile casino, and many of the games are identical counterparts to their PC cousins. 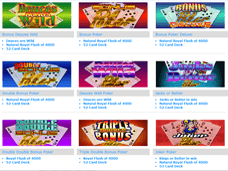 The casino is powered by BetOnSoft and Rival Software, meaning that the games are different than probably 80% of the American friendly Android casinos you will see out there. As with the casino’s buttons, the games were designed great and gave me a superior touch and feel for the options while playing. I never had a misbet or selected anything wrong here, and the games were smooth as butter. If you are looking for some of the best Wizbet slots to play on your Android, I highly recommend Road Trip 66, Horn of Plenty, and Code 211. All three of those games were fun to play, and their bonus rounds and features got me some nice sized wins. Video poker is also offered at Wizbet through the Android site, and while I am not a fan of the games, they do play pretty well. Large menu buttons make choices easy, and the graphics and sounds are pretty solid in their own right. One thing that I am pretty disappointed with though at Wizbet is the lack of table games on the mobile site. The PC version of the casino has all sorts of table games, but none have made their way to Wizbet’s mobile offering. This is a big issue for me, as some of my favorite casino pastimes are Blackjack and Poker. This is one area that the casino’s software provider BetOnSoft needs to clean up quickly, lest they lose business to casinos that do offer these games. After playing for about 4 hours at Wizbet, I decided that I had seen enough and wanted to withdraw my money in order to move on. When it came time for me to withdraw funds, I was given the following options: Check by Courier (Fedex), Check by Mail, Bank Wire, and Credit Card Refund. Punters in other countries have these options as well but also can choose from: Skrill, Neteller, EcoPayz, and Ukash. I myself opted for the Fedex Check as it was the fastest option. I ended up having to go to my PC in order to upload some identity documents, but the whole withdrawal process was very fast, and within four business days I had my check. There were no issues getting the money into my bank, and everything cleared as it should. All in all, I feel that Wizbet is a very good Android compatible casino with great service, nice bonuses, and good games. I definitely need to see BetOnSoft adding table games to their library in order to keep me coming back, but other than that there is little to complain about here.